Britain prides itself on being a nation of pet lovers, with an estimated 30 million people owning domestic animals. But every pet owner lives with the knowledge that their beloved animal will one day join the two million cats and dogs which die every year. The trauma of losing their four-legged friend can be even greater if the owner has to make the agonising decision to have their pet "put to sleep". Now Scotland's first pet funeral service is aiming to help grieving pet owners come to terms with the loss of their trusted companions. Dawn Murray runs her Pet Undertaker business with partner Dave from their cottage in Lanark. The boot of their Skoda car doubles as a hearse which carries deceased pets from the vet to their final resting place at one of a string of private pet cemeteries across Scotland. She also organises cremation services at a specialist pet crematorium near Carlisle, which provides grieving owners with a personalised, hand painted and engraved urn containing the ashes of their pet. Dawn, who is also a trained pet bereavement counsellor, said many owners fork out up to £700 to give their dog or cat a suitable send off. She is just as willing to bury a hamster as she is to cremate a horse, goldfish or budgie, and hit upon the idea after being horrified at how her own dog Kaz was treated when he died. Dawn said: "The chap arrived and said 'is this the deid dug?' and picked Kaz up. His head was rolling about everywhere, his neck was broken as a result. "He carried Kaz out in full view of my neighbours. There was absolutely no dignity in that final ending for my pet and that was the day I decided to become a pet undertaker." Dawn said business was booming with so many pet owners having to come to terms with the agony of deciding to have their animal put down. Among her clients is Geraldine Fyfe, from East Kilbride, who arranged for terminally ill dog Toby to humanely killed and employed Dawn to take charge of her pet's final hours. Geraldine said: "I took him a walk down the park and that was really upsetting because I knew that would be his last long walk. Then it was bath time and got him groomed because I wanted him to be nice. "I kept on kissing him and cuddling him and crying. Even when I was bathing him I couldn't see him for the tears." 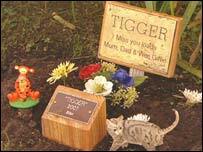 After being put down at a local vet surgery, Dawn compassionately placed Toby's body in a wooden coffin alongside his favourite toy - a teddy bear - and drove him to the crematorium. 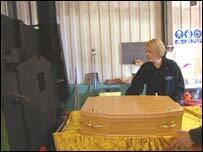 She returned later the same day with an urn of Toby's ashes which she handed over to Geraldine. While cremations are becoming increasingly popular, many pet owners prefer full burial services in specialist cemeteries such as Peternal Glen or Flatfield Garden, both in rural Perthshire. Flatfield Garden owner Paul Eddy has buried hundreds of animals in neat rows and plots, but said he did not want people to think of the graveyard as a sad place. He said: "We see it as the pets being at rest, they are happy and their owners are content that the right thing is being done. It gives you a sense of calmness." Many owners regularly come to the cemetery to leave flowers at their pet's graveside, often long after their deaths. Others even employ psychics in an attempt to contact their pets at the mythical Rainbow Bridge, where some animal lovers believe the spirit of their pet waits loyally for their owner to pass over into the afterlife. Carol McPherson, from Dundee, buried her dog Sassy at Flatfield almost two years ago and still visits the graveside twice a week. "When I lost Sassy I wanted to run across the Tay Bridge and jump in," she said. "I found the separation hard but I know she is at peace and that is the main thing. I couldn't have her suffer. She had kidney failure and I knew I had to let her go. "I spent Christmas Day with her. Maybe people think I'm mad but I do think she is listening to what I am saying." Dawn Murray features in the documentary Auf Wiedersehen Pets to be broadcast on BBC 1 Scotland at 2235 GMT on Tuesday 18 March.